Are you ready to be on the front lines of the war against disease and infection? 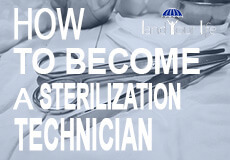 Read this exclusive Land Your Life guide for becoming a Sterilization Technician. A recent Ebola panic gave us a glimpse into a world none of us living in North America today have ever experienced. It is a world in which human beings are nearly defenseless towards invisible, life-threatening dangers we do not understand. Michael Gilchrist’s article, “Disease & Infection in the American Civil War” demonstrated that, before the benefit of aseptic medical care was proven, and before the role of bacteria in infection was understood, soldiers stood a much greater chance of dying of disease and wound infection in a hospital tent than they did on the battlefield. During the Civil War, Union soldiers died from disease (62%) and wounds (13.3%) far more than they died in action (under 19%). Those results improved dramatically during the Spanish American War (only 25.6% died from disease and 6.1% from wounds) and improved with each subsequent war, through the Korean War. Becoming a sterilization technician is an excellent way to enter the healthcare field quickly. It does not necessarily require more than a high school degree or a G.E.D. In these cases, technicians get on-the-job training. Nearly six out of ten technicians have only a high school diploma. Conversely, 35% have completed some post-secondary courses. These courses include topics such as medical terminology, sterilization techniques and equipment management. However, on-the-job training at one particular health care facility may limit future prospects elsewhere. This is because some medical institutions may not recognize its validity. There is a way to increase your viability in the job market. Get formal training by enrolling in a central service and sterile processing program at a trade school or community college. In fact, 35% of sterilization technicians have completed some post-secondary courses. These topics include medical terminology, sterilization techniques and equipment management. Formal training will also make it easier to obtain state certification. That may be coming soon to your state (see below). If your school offers it, consider enrolling in an externship at a medical facility or hospital. This will provide networking opportunities that may lead to quicker full-time employment. Currently, states generally do not regulate sterilization technician jobs. This situation allows people to get these jobs rather easily with just a high school diploma or a G.E.D. However, in the future, your job will be easier to get and to keep if you attend community college or technical school. This is because many states are looking at requiring certification for sterilization technicians. State certification requires passing a set of exams, much like doctors must pass a set of exams to become licensed. States are tightening their rules and certification (formal training) may become a requirement. As of July 2018, Connecticut, New Jersey, New York, and Tennessee are the only states that require certification of sterilization technicians (also called Central Service technicians) according to the International Association of Healthcare Central Service Material Management (IAHCSMM). There are two independent international certification organizations, the CBSPD in New Jersey, and the International Association of Healthcare Central Service Material Management (IAHCSMM), based in Chicago. The IAHCSMM offers five kinds of Central Service certifications. Sterilization technicians, the unsung heroes of the healthcare field, work in hospitals, medical centers, nursing homes and other medical facilities to ensure that any non-disposable medical instruments or equipment is clean, sterile and in good working order and that there are enough supplies on hand. They must become familiar with the different types of equipment needed for different procedures. They work closely with nurses, doctors and other medical professionals such as dentists. Although the work can be repetitive, there will always be work for sterilization technicians, because medical treatment cannot safely proceed with clean, sterile instruments and equipment. The sterilization technician is responsible for disinfecting and sterilizing medical devices and surgical equipment that cannot be thrown away and must be reused during the 46,500,000 annual surgical procedures and invasive procedures, such as endoscopies or surgeries, that involve contact between medical equipment and a person’s mucous membranes or sterile tissue. Given the increase in antibiotic-resistant bacteria such as MRSA, the sterilization technician’s role is likely to become even more important in the future. Certainly, the field is always changing and adapting to new advances and discoveries; the Centers for Disease Control and Prevention regularly issues advisories on updates and advances in the field. What Does an Average Day For A Sterilization Technician Look Like? As a sterilization technician, you are a fundamental “cog in the machine” that is a modern health care facility, providing the clean, sterile, up-to-date, working equipment that doctors and nurses need to complete their jobs—without your contribution, work in a hospital would grind to a halt. You’ll spend the day cleaning and sterilizing instruments, making sure instruments and equipment are in working order and free of defects, ordering supplies and making sure that outdated supplies are thrown out. You will also need to report defective equipment to staff. All equipment must first be manually cleaned, placed in a sterilizing autoclave, and wrapped, so that it remains sterile until use. Preparing surgical kits and assembling instrument trays, including individualized kits for surgeons, is an important part of the work. The job is indoors, in an environmentally-controlled atmosphere. It will require wearing protective safety equipment such as safety shoes, glasses, and gloves. This is because technicians are near contaminants, disease, and infectious viruses or bacteria on a daily basis. The work may also include some heavy lifting. Are You Suited To Be A Sterilization Technician? Sterilization technicians should be relatively physically fit. This is because they will need to stand for long periods of time. You should be able to think critically, listen actively and comprehend information. It will be your job to detect potential problems, monitor and process information. You will engage in quality control analysis. The job can be stressful. The reality is you will be working among a hierarchy of medical professionals, including doctors. Unfortunately, this could mean that if a mistake or a problem with infection occurs, others may place blame on you. You will need composure and self-assurance to deal with situations such as these. The only way to have that confidence is to make sure your work is beyond reproach. In addition to doing your best to perform an outstanding job, you can be certain of yourself by keeping records or notes of things you have done to ensure high quality control. When you’re starting out, developing relationships with superiors with experience will be important. Important character traits for successful sterilization technicians include being dependable, cooperative, detail-oriented and vigilant (particularly about safety). Having good judgment and an ability to work independently are also important. A strong sense of honesty and ethics is crucial. In other words, if you know you have messed up, own up to it immediately—an error in sterilizing a surgical instrument may not be seen to the naked eye, but it could lead to devastating consequences. A doctor or nurse may slip up and fail to wash their hands, but even the best hygiene on everyone else’s part won’t make a difference if they are using unclean equipment. People’s health and even their lives are in your hands. Even though a high school diploma is enough to get started, you may decide to get State Certified. Learning Path and Medical Technology Schools list a number of community colleges or technical schools that offer sterilization technician programs. How Does A Sterilization Technician Find Work? Hospital websites, online job search sites, job fairs and even newspapers (really!) are the first place to look. However, the best move, beyond the basic steps like posting your resume on job search sites like Monster.com or Indeed.com, is to join a chapter of the IAHCSMM, the certification organization discussed above. There are more than fifty chapters in 36 states and three countries. Joining a professional organization like this dramatically increases your networking and educational opportunities. You’ll have access to meetings, seminars, workshops and even social events. It gives you the perfect opportunity to talk with others in your field and participate in professional development programs. For example, the New Jersey Health Care Central Service Association is one such organization. If you are interested in advancing your career to becoming a surgical technician, join the Association of Surgical Technologists. Joining a professional organization not only keeps you informed and involved in the field, it helps you to advance your career and find mentors. It demonstrates to others that you`re not just after a paycheck…you are truly interested in the health care field. What is the Average Salary of A Sterilization Technician? According to the Bureau of Labor Statistics, as of 2017, a Sterilization Technician, or a “Medical Equipment Preparer,” made a median salary of $35,370 annually, or $17.00, although wages were as high as $52,240 or $25.11 per hour. Salaries are slightly higher in hospitals, outpatient care centers, doctors’ or dentists’ offices, and specialty hospitals (except psychiatric and substance abuse hospitals). To increase your salary, elect to get training instead of entering the field with just a high school diploma. Getting training not only demonstrates your commitment to the field, it improves your chances of getting a better job. It also exposes you to other topics in the field; becoming a sterilization technician might just be the beginning for you. This field is expected to grow, according to the BLS. The BLS projects that the medical equipment preparation field will grow by 20% which is 10% faster than average. In general, healthcare, America’s largest industry, is one of the fastest-growing fields. That is why keeping current, by joining professional groups and getting continuing education, is vital to becoming an integral part of the job force of the future. If you decide to stay out of direct patient care, you may decide, like many technicians, to move on to supervisory and then management roles, which can dramatically increase your salary. A sterilization processing manager earns between $47,980 – $96,126, or an average of $68,176. You may have chosen health care, because you want to work with patients—a path that is readily available to you, with time and education. A first step in advancing your career in this way is to become a surgical technician or technologist. In this case, you would be working directly with nurses or doctors in surgery or other procedures. With specialized skills in open heart, orthopedic or OB/GYN surgery, the median pay is $46,310 annually. Join the Association of Surgical Technologists for advice in this field.